Good Morning!! Sorry for the lack of post but the past week has been bounding time for me and baby I. We are learning each other and it has been fun and yet trying. So today I wanted to share another layout I made with the June Citrus Twist kit. I'm pretty sure there are a few still available to purchase and honestly you won't want to miss this kit. This layout was created using an old sketch Kasia designed. Beautiful! Love how you framed the sun burst pieces with twine. Enjoy your time with baby and get some rest! 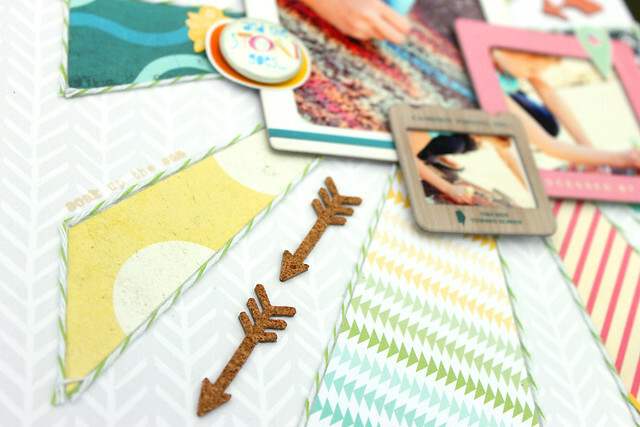 Really love the sunburst design and papers--the colors are awesome and go quite well with your pics! I love this! That sunburst is fantastic! cool page and your blog is sweet! Beautiful page, Angie! I love the rays and layered frames. Love the trio of slide frames, the the pale background, small sunburst really still lets the colors of the chalk photo stand out!